Soluble vs Insoluble Fiber: What Are They? Fiber is an important nutrient in diet and is available from various plant sources like fruits, vegetables, whole strains, nuts and legumes. Fiber rich diet makes you feel full since it takes up more space than foods containing no fiber. 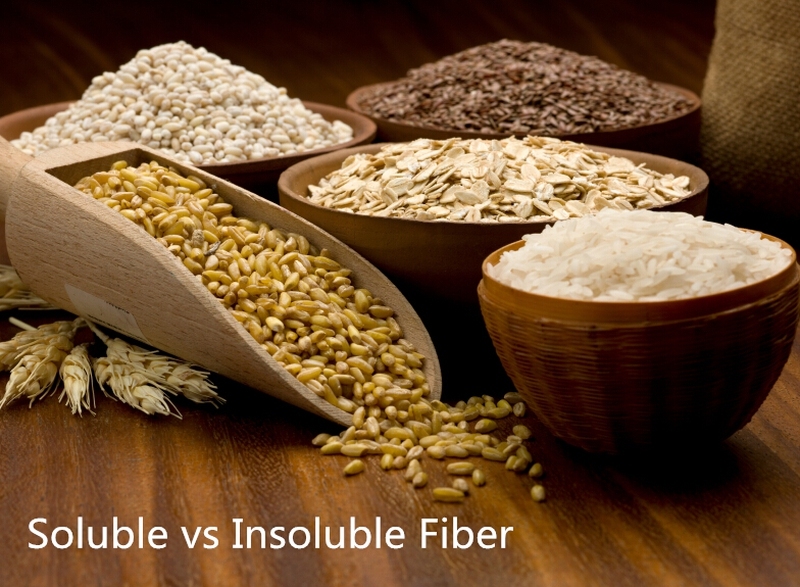 Here we will discuss the two main types of fiber: soluble and insoluble fiber. Fiber obtained from food sources are of two types: soluble fiber and insoluble fiber. We will first take a look at what is soluble fiber. Soluble fiber, as the name suggests, is soluble in water. When combined with water, a gel-like substance is formed which swells in size. The scientific names of soluble fiber are pectins, gums, mucilages, etc. The good food sources of soluble fiber are apples, beans, berries, carrots, celery, cucumbers, dried peas, flaxseeds, lentils, nuts, oat bran, oat cereal, oatmeal, oranges, pears and psyllium. You can find more soluble fiber contents in common food by click here. The fiber which does not dissolve in water is referred to as insoluble fiber. It does not get digested in the body and usually gets passed out from the body in its original form. Insoluble fiber is also referred to as cellulose, lignin, etc. You can find insoluble fiber from barley, broccoli, brown rice, bulgur, cabbage, carrots, celery, corn bran, couscous, cucumbers, dark leafy vegetables, fruits, grapes, green beans, nuts, onions, raisins, root vegetable skins, seeds, tomatoes, whole wheat, whole grains, wheat bran and zucchini. So between soluble and insoluble fiber, which one is better for you? To get the answer, you must know the benefits of each one before choosing the one fit you. When you eat foods containing soluble fiber, it absorbs the water in the gut and forms a gel like substance. This slows down the digestion process and delays the emptying of stomach. This is beneficial when you want to control weight. Delayed gastric emptying is related to blood sugar levels and is beneficial on insulin sensitivity. Thus, it is good for diabetics. Soluble fiber also interferes in the absorption of dietary cholesterol, thus helping in reducing LDL cholesterol levels. Insoluble fiber adds bulk to the diet, has a laxative effect and is gut-healthy as well. Therefore, it is helpful for people suffering from constipation. It does not get dissolved in water and passes through the gastrointestinal tract intact. This speeds up the passage of food and helps in defecation. The recommended allowance for fiber is different for men and women. Women should have 25 gram per day and men should have 38 grams per day of fiber. The proportion for soluble and insoluble is not provided, but usually, on an average, people take 3/4 insoluble fiber and 1/4 soluble fiber. This is because there are more insoluble fibers contained in whole grains and vegetables. Opt for whole fruits instead of fruit juices. Make a habit of reading ingredient and nutrient labels for whole foods and dietary fiber content. Opt for bran or high fiber cereal in breakfast which contains at least 5 grams of fiber per serving. Raw vegetables can be had as snacks and replace refined foods with whole grain products. Incorporate legumes, seeds and nuts in the diet and have vegetarian meals at least once a week. Fiber supplements may be used to meet requirements; however, the benefits are not studied as extensively as dietary fiber.